Fractures of the pelvis occur when the tumor in sagittal and frontal areas and belong to serious injuries of musculoskeletal system. Fractures of the pelvis are symptom "stuck heels". 4) vertical fracture of the pelvis front and back type of Nalgene - unilateral, bilateral or cross. Isolated fracture a bone or bones pelvic ring (in any case) the patient is laid on the bed with wooden shield, his feet placed on the platen diameter of 60-80 cm (depending on growth) so that the bend in the knee joints was 140 degrees, the heels of your feet are connected, knees divorced position "frogs" (Fig. 24). At break pubic joint feet on the roll lie in parallel, the pelvis is fixed belt Hilferding (Fig. 25). Therapeutic physical training is assigned to the 2nd day of the injury. I period lasts from the moment of injury to the permission to turn on the stomach is approximately 10 to 16 days. 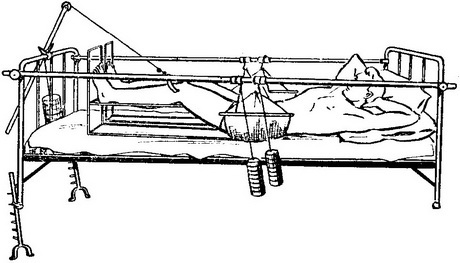 Tasks of therapeutic exercises in the first period: the removal of the patient from the oppressed due to injury status; relaxation of the muscles of the pelvic area for proper matching of fragments; the removal of pain; increased muscle tone of the lower extremities, resorption of hemorrhage, the restoration of the organs of respiration and circulation, excretion and metabolism. In the first period are breathing, General developmental exercises, as well as special exercises for the legs: the stretching and bending of the fingers, all traffic stops, bringing up the legs to the stomach (in the first 2-4 days without lifting the heels of the bed), "walk" lying, breeding tribes (at break pubic joint, it can only be done in 4-6 months after the injury), lifting his feet up roller. After the restoration of muscle tone of the lower extremities can be lifted straight legs above the fold. Breathing exercise is repeated 3 times, General developmental and special-6-10 times. The duration of sessions of 20-30 minutes, 4-5 times a day. Turn on the stomach is performed if the patient freely raises two straightened legs above the fold. Then the roller is removed and the patient lies in the normal position. In the II period of the objectives of therapeutic exercises are: recovery of muscle tone in the lower extremities and the strengthening of the back muscles and the pelvic area. The transition from a prone position on his stomach in the standing position is resolved through 4-8 weeks from the moment of injury if the patient lying on his back, performs the following exercise: raises two straightened his legs up, lifted bent legs to her stomach, straightens on weight, divorces, turns and puts her on the bed. The third period starts with the date of transfer to a standing position and continues to discharge to work and permissions to sit. The objectives of therapeutic exercises are to restore normal gait and General training of the whole body. Special attention during the classes should be paid to the right foot, as can be formed pathological "duck" gait, when the trunk is currently being transferred from side to side, or "privilegiada" gait, when a patient is dragging one leg behind him. Exercises are performed in standing, walking (on toes, heels, on foot, in a fast, krestnym step forward, back, side, and so on), gymnastic wall (at break pubic joint squat is possible only with the United feet). Sit permitted provided that if after a two-hour walk the patient does not experience pain in the fracture and a feeling of heaviness in the legs. Classes are held 3-4 times a day, continue 40-60 minutes Dosed walking appointed 3 - 4 times a day. Capacity for work is restored through 1,5-3 months.